The protein powder I’m excited about is Whey Pure – Undenatured Contaminant Free New Zealand Whey Protein. 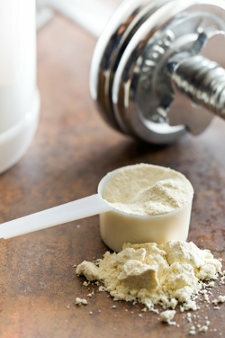 It’s perhaps the cleanest whey protein on the market. It blends great in smoothies and provides a rich source of amino acids. Whey Pure has been proven in clinical trials to stimulate the immune system, promote the development of lean body mass, and promote intestinal health. For more information on Whey Pure or to purchase some for yourself, click here. If you’re wondering, I cycle on and off various protein powders. If you’re not into protein powders you can still create a delicious and nutritious smoothie without it. The recipe below is the bare-bones version. You can take this smoothie in several different directions depending on the add-ons that call to you. I typically add avocado to my protein smoothies for additional fat and a thicker consistency. I also usually add cacao because I love chocolate :) If you’re using a flavored whey protein that may direct which add-ons you use. Enjoy! I’d love to know if you try this whey protein smoothie and how you customized it. Please leave a comment below. Happy Blending! My husband and I just started using whey protein and so I am so glad that you listed off some ingredients that can be added to it to make a good smoothie. I definitely love the idea of adding nut milk, sea salt and honey. However, I will probably skip out on the cinnamon and add cacao powder instead. Always here to help, Faylinn :) Cinnamon actually pairs well with cacao. Hope you and your husband enjoy the smoothies! I love pure whey protein ( I get it from a different company and it’s organic) with home made kefir , blueberries and a small banana. Sometimes I add milled flax etc. It gives you a great boost for the day and is particularly good for my husband who has a slight tear in an abdominal muscle. I only use 1 scoop between the two of us as the Kefir gives it a double hit. I just made thjs smoothie today. I bout thr bags of fruit that has carrots and mangos and otjer fruit. I haf blueberries i added those also. I added the cinnamon, sea salt and coconut oil eith the protein powder. I am a diabetic so i love smoothies for lunch. Sounds like you made one healthy smoothie, Leigh. Hello Ryan. I came across your website about a week ago and I have to say i’m hooked. However I have a dilemma I currently work out just before bed as thats the only time I have available. I was wondering if you could advise me on a protein smoothie which is not only effective but sits well as I sleep and wont add on any extra pounds. I use the sun warrior protein that you mention in other areas of your sight. I used to workout late as well. One thing you can do is consume half your smoothie before working out and the other half after. Another thing to try is using less liquid, as little as possible, so that your body can digest the smoothie faster. All of the protein recipes on my site are similar and shouldn’t differ much in digestibility. Find a couple that you like a stick with those. Hey there, I’m a huge fan of smoothie and this whey protein smoothie look way awesome! Definitely will try it! Hope you enjoy it, Bella.